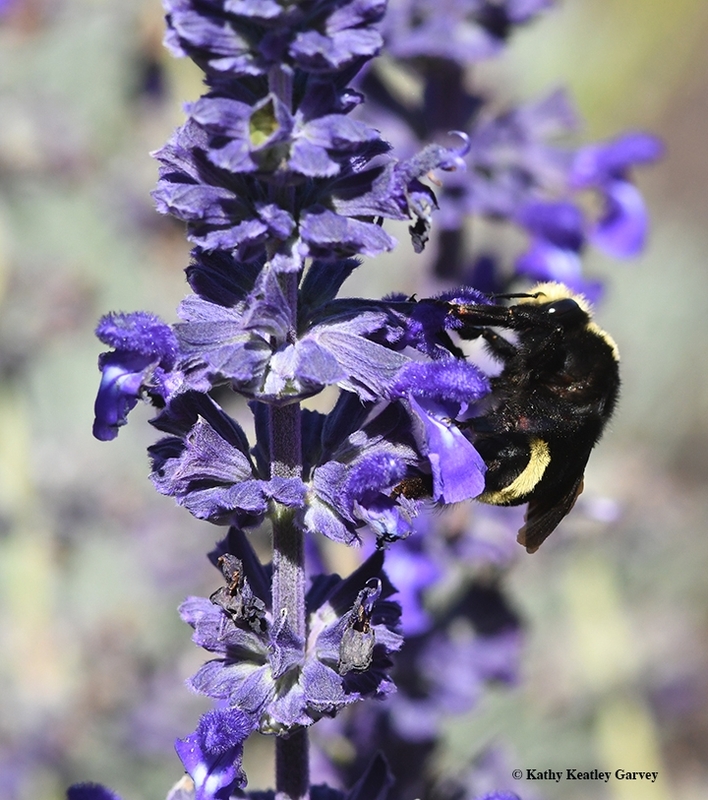 You can see, salivate--and purchase--salvias and more at the spring premiere plant sale sponsored by the UC Davis Arboretum and Public Garden on Saturday, April 6. They'll offer everything from "Bee's Bliss" to "Black Lace" to "Blaze" to "Brilliance." Among the many others: "Whirly Blue, "Pozo Blue," "Marine Blue," "Little Kiss," "Midnight," "Pink Cadillac" and "Hot Lips." The plant sale, open to the public, is set from 9 a.m. to 1 p.m. at the one-acre Arboretum Teaching Nursery on Garrod Drive. It's a great place to buy plants to attract our pollinators: bees, butterflies, birds, beetles and bats. Not to mention syrphid flies, aka hover flies/flower flies! You can download the plant sale inventory on the website. Favorites include the Arboretum All-Stars and California native plants, as well as herbs, perennials, shade plants, bushes, trees, vines and more. Can't make it on Saturday, April 6? Plant sales are also scheduled Saturday, April 27 and Saturday, May 11. Happy spring! Happy salivating! And happy/hungry pollinators! Remember receiving valentine cards that read "Bee My Valentine?" Well, every day can be Valentine's Day when there are bees in your garden. 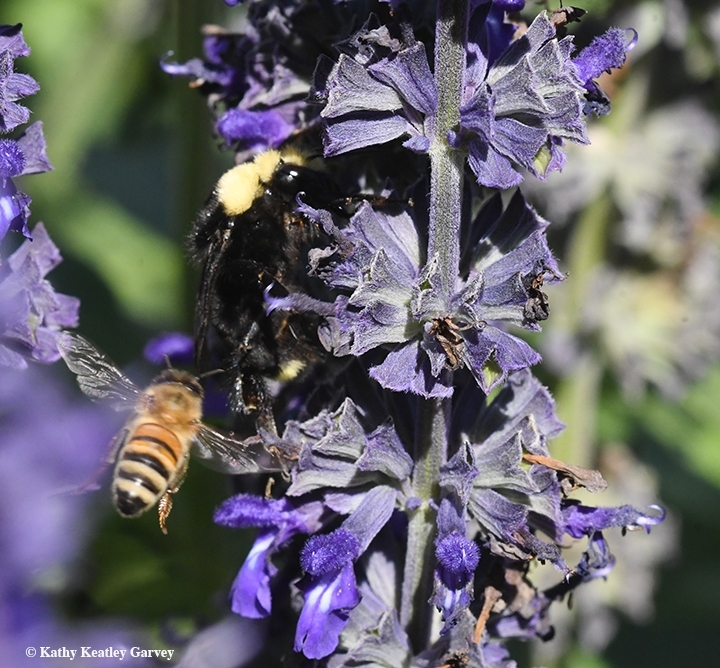 We captured this image several years ago of a queen bumble bee, Bombus vosnesenskii, nectaring on a spiked floral purple plant, Salvia indigo spires (Salvia farinacea x S. farinacea). She had just emerged from her winter hibernation on a sunny day in November. 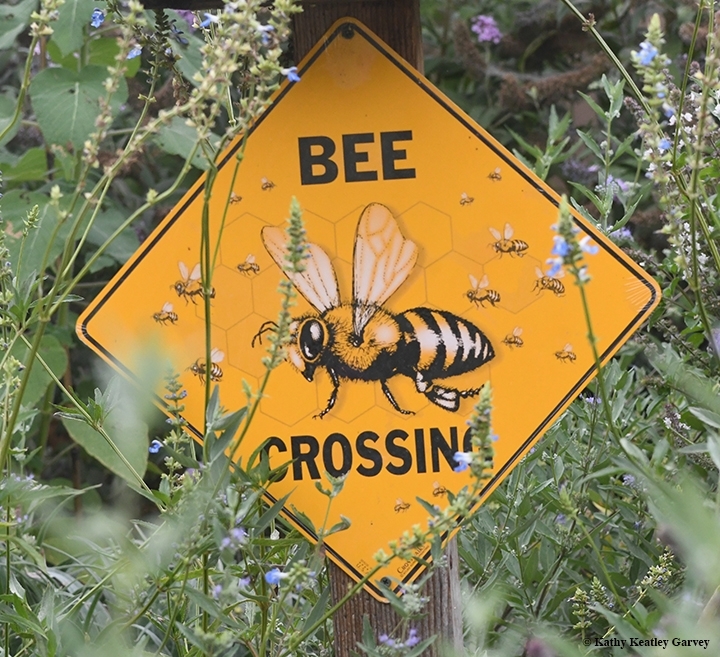 The site: the Sonoma Cornerstone pollinator garden of Kate Frey. 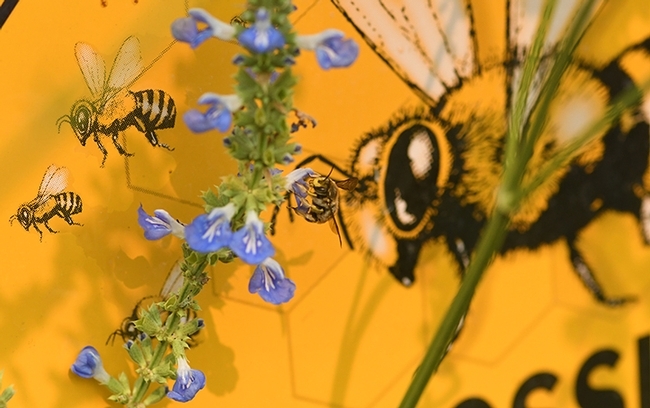 She's the co-author of The Bee-Friendly Garden (with UC San Francisco professor Gretchen LeBuhn), and a world-class garden designer and pollinator advocate. It wasn't Valentine's Day, but then again, yes, it was! Every day is Valentine's Day when there are bees in your garden. Some folks call them "bumble bees," but they're not. 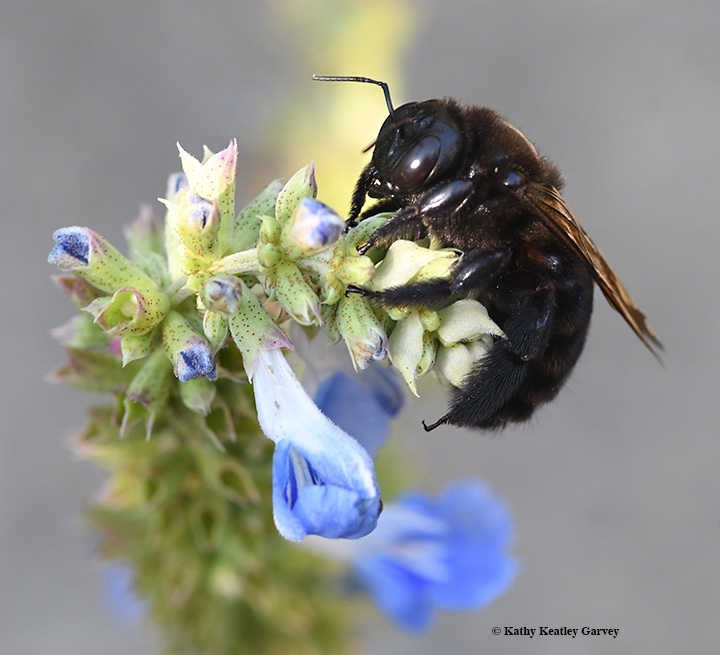 In size, the female Valley carpenter bee (Xylocopa varipuncta) resembles a bumble bee, but certainly not in color. The female Valley carpenter is solid black with metallic wings. 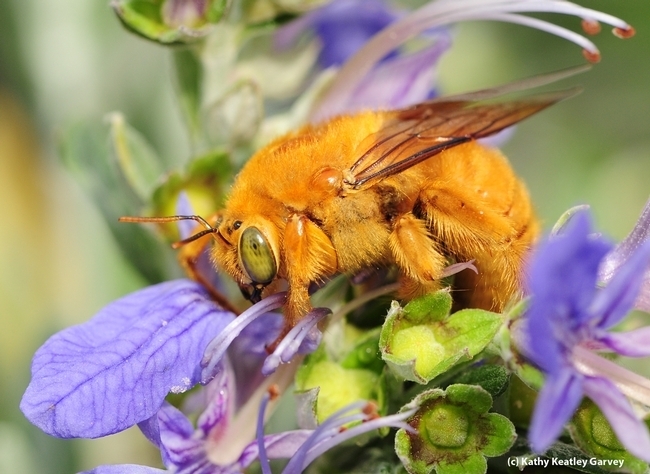 The male of the species is a green-eyed blond, fondly known as "the teddy bear" bee because it's fuzzy-wuzzy and cannot sting. Entomologists will tell you that the male and female are dramatic examples of sexual dimorphism. Yes, they are! 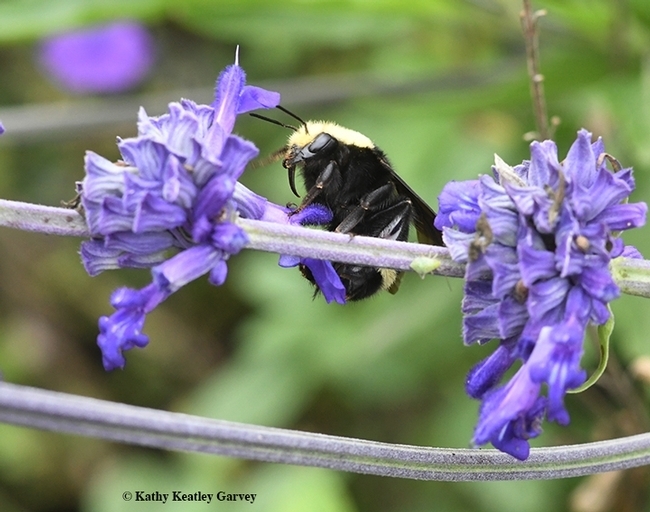 We've been seeing a lot of female Valley carpenter bees lately on our blue spike salvia, (Salvia uliginosa). They engage in nectar-robbing: this occurs when bees circumvent the usual plant-pollinator relationship and "cheat" by entering a flower from the outside to steal nectar. They drill a hole in the corolla to reach the nectar, thus avoiding pollination or contact with the anthers. Similar-looking insects include bumble bees, cactus flies and horse flies, according to California Bees and Blooms, a Guide for Gardeners and Naturalists,by UC-affiliated authors Gordon Frankie, Robbin Thorp, Rollin Coville, and Barbara Ertter. "Carpenter bees are shinier and have less hair than fuzzy bumble bees. 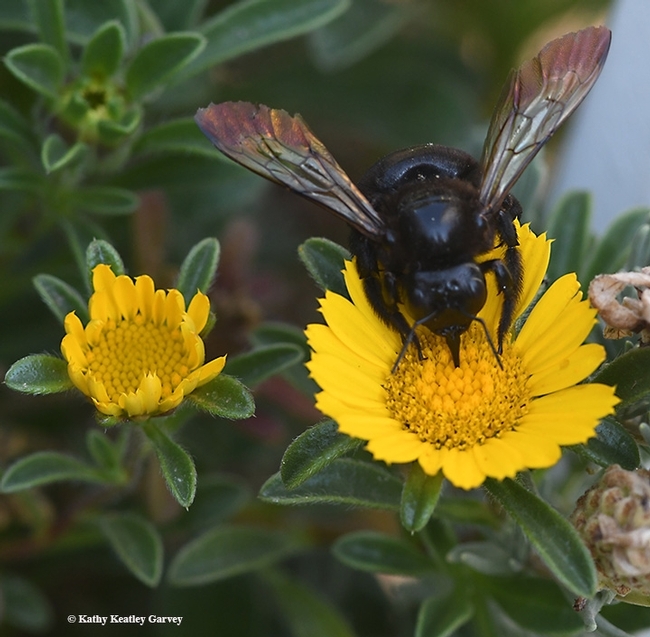 Carpenter bees have two pairs of wings, and they have long, slender, elbowed antennae, while fly mimics have only one pair of wings, and short stubby antennae." 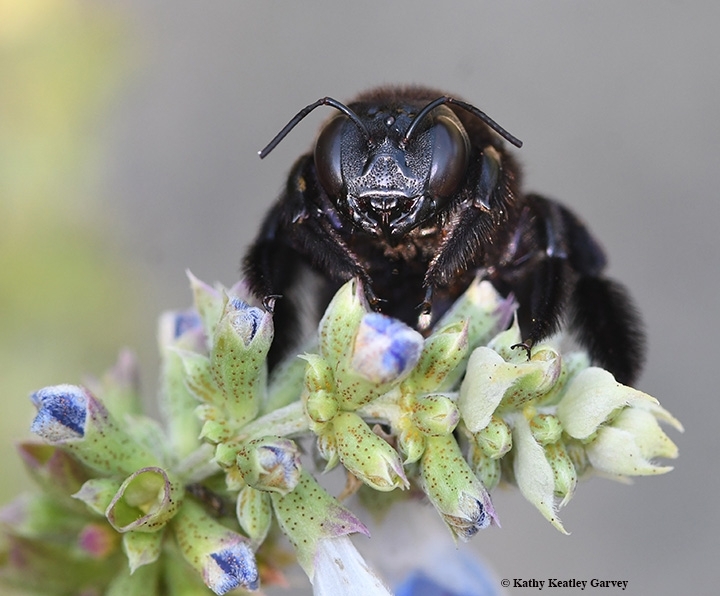 The Valley carpenter bee is California's largest carpenter bee. They're large but they're elusive. They usually don't linger long for you to grab a photo. This one did. It was early in the morning, and like a true human morning person, she declined to move fast. The news is disturbing but not unexpected. Scientists are linking global climate change to one reason why the worldwide population of bumble bees is declining. 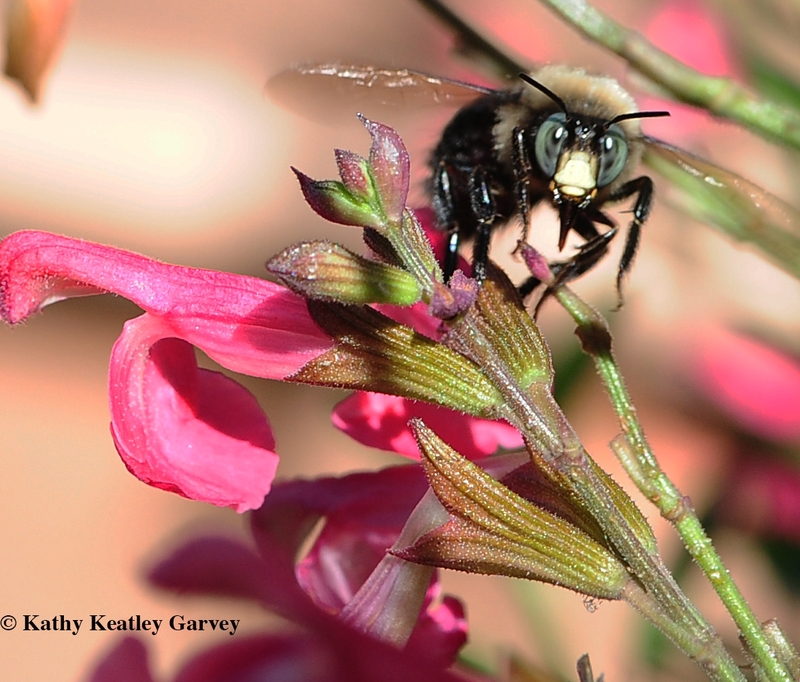 An article published Sept. 28 in the journal Ecology Letters by Florida State University (FSU) researchers showed that bumble bees just aren't getting enough floral resources. 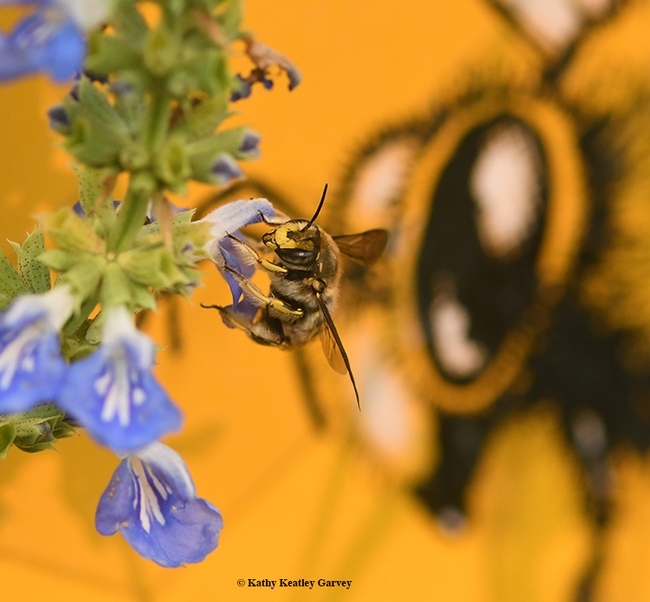 For the study, lead researcher and postdoctoral fellow Jane Ogilivie and six colleagues examined three subalpine bumble bee species in Colorado's Rocky Mountains, and found that the changing climate means fewer flowers. 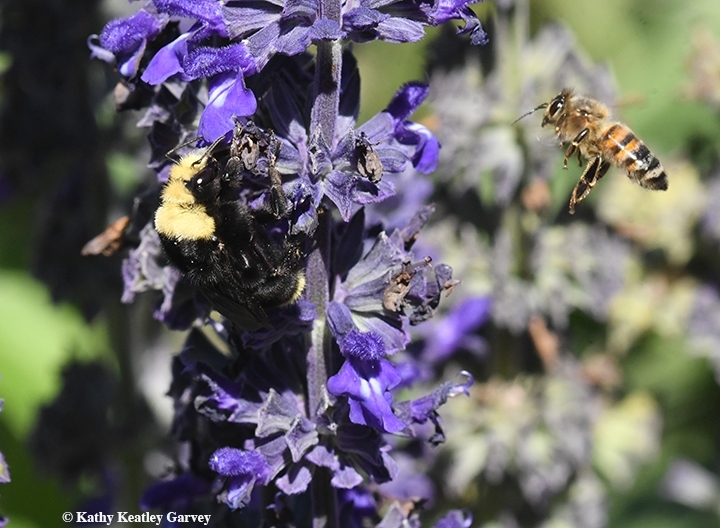 "Knowing whether climate variation most affects bumble bees directly or indirectly will allow us to better predict how bumble bee populations will cope with continued climate change," Ogilivie told the FSU News Service in a press release. "We found that the abundances of all three bumble bee species were mostly affected by indirect effects of climate on flower distribution through a season." The FSU News Service aptly headlined the research a "Stinging Report." The researchers wrote in their abstract: "Climate change can influence consumer populations both directly, by affecting survival and reproduction, and indirectly, by altering resources. However, little is known about the relative importance of direct and indirect effects, particularly for species important to ecosystem functioning, like pollinators. 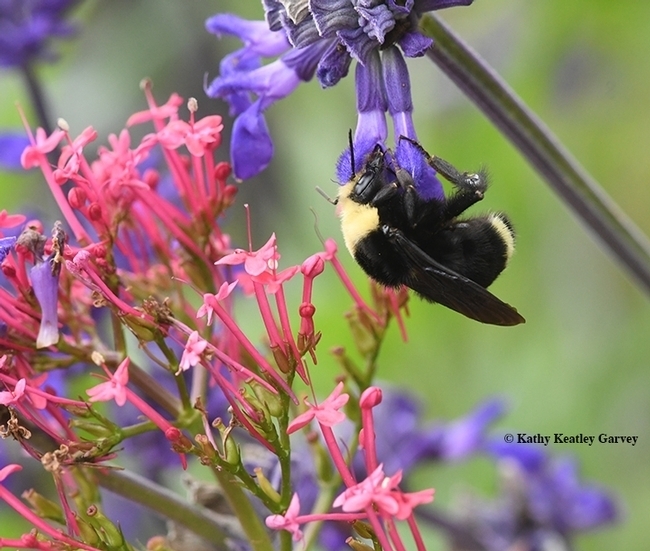 We used structural equation modelling to test the importance of direct and indirect (via floral resources) climate effects on the interannual abundance of three subalpine bumble bee species. In addition, we used long-term data to examine how climate and floral resources have changed over time. Over 8 years, bee abundances were driven primarily by the indirect effects of climate on the temporal distribution of floral resources. Over 43 years, aspects of floral phenology changed in ways that indicate species-specific effects on bees. Our study suggests that climate-driven alterations in floral resource phenology can play a critical role in governing bee population responses to global change." Bumble bee expert Robbin Thorp, distinguished emeritus professor of entomology at the University of California, Davis, long ago sounded the alarm that bumble bees are in trouble. 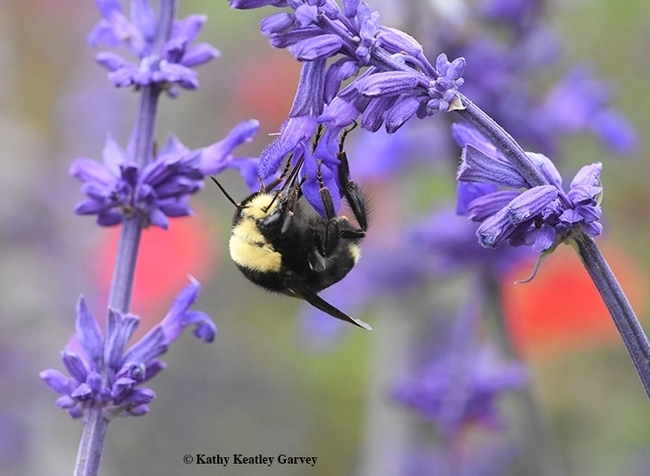 He is the co-author of Bumble Bees of North America: an Identification Guide (Princeton) and California Bees and Blooms: A Guide for Gardeners and Naturalists. 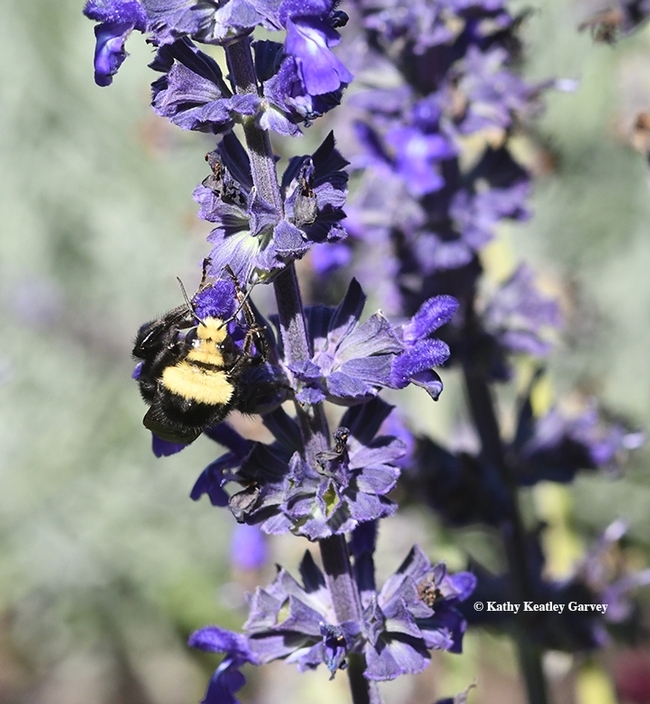 The last bumble bee we saw--the last of the season--was on Sept. 23 at Kate Frey's pollinator garden at the Sonoma Cornerstone, Sonoma. It was a yellow-faced queen bumble bee, Bombus vosnesenskii, nectaring on a spiked floral purple plant, Salvia ‘Indigo Spires' (Salvia farinacea x S. farinacea). The queen had apparently emerged from hibernation to find food on that warm summerlike day. I knelt to capture some images. "Oh, it's just a bumble bee," scoffed one tourist, casually sipping a glass of wine. "They're everywhere."